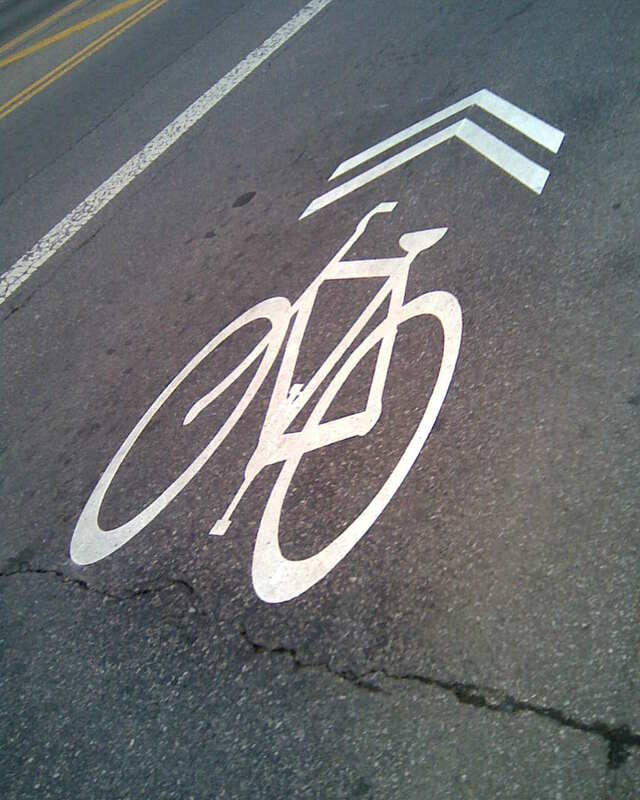 We have our sharrow in Columbus. Well, we have one marking, but you have to start somewhere. Yesterday, at the Bike To Work Week Launch event at the South Campus Gateway, Mayor Coleman unveiled the first sharrow marking for the city. 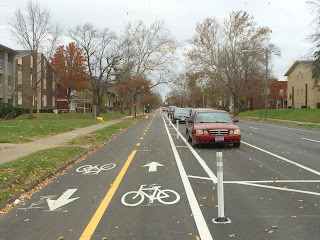 The sharrow will run from Morse Road to Nationwide Ave. in the Arena District. Which raises the question.... that's great. 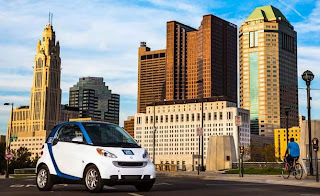 But what are they going to do with the cars that are parked on High Street in the Old North Columbus and Short North areas, where recessed parking does not exist? If you're going to create a marked bike route in an attempt to create a safer way for people to travel by two wheels and no motor, it seems logical that you'd want it to be... well, safe. But having a sharrow with people parked in it? Assuming that the sharrow is going to be in the right lane all the way down High Street, and I can't imagine that they'd put it in the left lane, you're going to have to deal with lots of parked cars - especially during afternoon rush hour, when the roads are trickiest. So what's the plan? Anyone know? Are they going to remove street parking along the sharrow? Or is this sharrow just for looks and political cred? In this type of situation I'd put the sharrow in the middle of the left lane. I'd remove the street parking altogether. That part of the road where you're moving people from the right lane with the sharrow into the left lane with the sharrow is just asking to be a location for bike/car collisions if you move the lane. According to Jeff Stephens at Consider Biking, the plan is to simply not have the markings at the points I mentioned, where street parking exists. Apparently this is considered "Best Practices" by the industry. Sigh. So "best practice" is to put Sharrows in where it's clear where to go, and then leave know clues when faced with tricky situation with parked cars and/or lane changes? That may be the best practice from a liability point of view, but it doesn't sound like a best practice from a safety point of view. Exactly my point, Rob. And yet another reason that I'm against these street-level infrastructure placements such as bike lanes and sharrows. If you're not going to put them in properly, you're hurting the very people you're trying to entice onto the streets with "safer" measures - new, inexperienced cyclists. I don't have a good mental picture of the street in question (I live in Louisville KY). In general, though, the point of a Sharrow is to show that bikes belong in the traffic lane (where the Sharrow is supposed to be painted) rather than in some other place (like a painted bike lane parallel to the main traffic lanes). 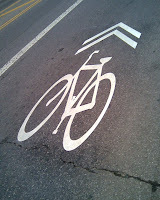 When used properly, the Sharrow can be a good thing--the key word in that being "properly." Here's to hoping your locals get the clues. I share your disdain for separate bike lanes (aka door zone lanes), as they tend to increase danger rather than decrease it, and simultaneously encourage those who would segregate cyclists as second- (or lower) class road users. They also tend to collect trash and debris, forcing me to avoid them most of the time. Bikeolounger - I actually feel very much the same way about sharrows. I think that any on-street markings have the same issue, and that's that they make drivers think that cyclists belong ONLY in such lanes. Cyclists belong anywhere they feel like riding, keeping in mind the principles of slower traffic stays to the right-most lanes and to follow the traffic laws. Really, it's that simple. Sure, there are techniques to ride more safely such as taking the lane, the scan-and-switch lanes, etc. but the actual rules are pretty basic. High Street, just for everyone's information, is the main surface-level thoroughfare through Columbus going north-to-south. Along most of the street, at least going from the North part of the city to downtown, is a five-lane road - two lanes going either direction with a central left-turn lane. The portion of High Street that will contain the sharrow has a mix of parking styles - some on the street, some in recessed parking off the main roadway, and some no-parking, and mostly no-stopping zones. It's either 25 or 35 MPH most of the way. I have to admit that I've not been on it on the southern part of town (south of downtown) as I've never had reason to travel much further south than the Brewery District. I rode down High St through the Short North yesterday for the Ride of Silence. I think the parked cars in the right lane make it safer for cyclists because other autos can't use that lane, or at least can't move with much speed without having to manuever around parked vehicles. I'd rather risk getting doored by a parked car (I'm well trained in avoiding that) than being hit by a car using the right hand lane. I think it is much safer riding on High St in the Short North compared to High St through campus where there is no parking. I think the sharrows should be painted on both lanes on High St. No confusion there. I think it is quite safe to bike on High Street through Campus. You will find a lot of bicyclists in that area, so motorists are cautious. Apart from that, there are hundreds of pedestrians waiting at cross walks or even crossing High street at random points. This makes the motorists drive slow and cautiously. I'd agree, except that a lot of the drivers around campus are younger and less experienced. Not only that, but I remember how I was driving at that age and it's a wonder I didn't get into any accidents. And this was before cell phones. But I do agree that the pedestrians tend to slow drivers down. Unfortunately, they're also not looking for cyclists on the road and I've nearly mowed down a couple of them as they weren't looking before they crossed. Of all the parts of High that I have to deal with each morning, campus is the most hazardous. Of course, High really isn't that hazardous, period, so that's not really a HUGE negative. Sort of like saying "That was the least snowy of the blizzards we had last winter."